Robert E. Franklin, 97, of Payne, passed away Thursday, November 29, 2018 at Van Wert Inpatient Hospice Center. Bob was born in Payne on Feb. 22, 1921 a son of the late Samuel & Charlotte (Gray) Franklin. 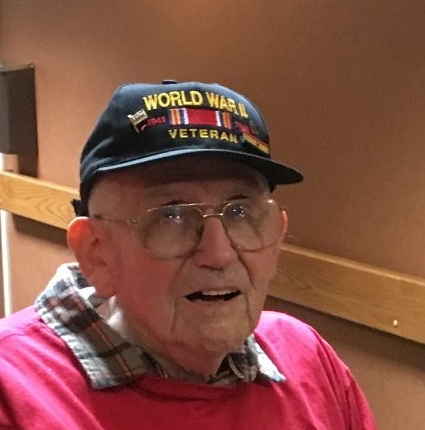 He proudly served his country in the U.S. Navy during World War II; worked as a planning engineer at International Harvester; had been the Marshall of Haviland, Mayor and village council member of Payne & Justice of the Peace for Blue Creek Twp. Bob enjoyed wood carving but his true love was God and his wife, Helen whom he married Oct. 21, 1944. She passed away Dec. 6, 2015. Bob leaves behind a son, James; brother, John Market and his grandchildren. He was also preceded in death by his daughter, Marie Angela Franklin and siblings, Samuel Frankiln, Maude Martin, Kathryn Waltz, & Donnie McGuinness. His funeral mass is Tuesday, Dec. 4, 2018, 11 am Divine Mercy Catholic Church, Payne. Viewing is Tuesday, Dec. 4, 2018, 9 - 10:30 am at Dooley Funeral Home, 5761 SR 500, Payne. He will be laid to rest in St. John the Baptist Catholic Cemetery. Memorials are to Divine Mercy for masses. PLEASE DELIVER FLOWERS AND OTHER TRUBUTES ON MONDAY BETWEEN 9 AM AND 4 PM TO THE FLOWER DOOR IN PAYNE.